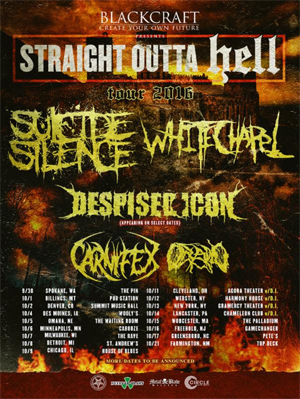 As previously announced, WHITECHAPEL will co-headline a USA run with SUICIDE SILENCE this fall! Sponsored by BlackCraft Cult Clothing (www.blackcraftcult.com), the "Straight Outta Hell" tour also features CARNIFEX and OCEANO as support, with DESPISED ICON appearing at select shows. This must-see trek kicks off in late September and ends in late October - see below for all confirmed dates so far, with more shows to be revealed soon! Currently on the road as part of the annual Warped Tour, WHITECHAPEL recently released their sixth full-length, Mark Of The Blade, worldwide via Metal Blade Records. Hailed as "an exciting milestone" (Alt Press), Mark Of The Blade was produced by Mark Lewis and sees WHITECHAPEL redefine who they are and what they are capable of with the resulting 11 tracks. Kicking off with "The Void" - which has a SLAYER-esque ferocity that is perfectly suited to the band's three-guitar attack - the songs that follow all leave a distinct impression, and by the time the rich, dark melodies on "Decennium" bring the record to a close, it's impossible to deny the emotional weight brought to bear. Alex Wade explains, "At this point in our career and as we grow older, we are taking a more open-minded approach to creating our music, allowing what we think sounds good to evolve naturally, rather than to just write what is expected of us." To purchase Mark Of The Blade in various formats, please visit: metalblade.com/whitechapel - where the video for the latest single, "Elitist Ones", can also be viewed. See below for all upcoming Warped Tour dates!